Hands up if you miss those old coin-op games where you had to eliminate hundreds of enemies without worrying about anything besides aiming at their heads while the camera moved around the setting automatically. These so-called shooters on rails run the gamut from the classic Operation World to undying gems like Time Crisis and The House of the Dead. And this genre is exactly where Gunpie Adventure fits in: this bit of pulp madness from the NEXON studio (Dominations, OZ Broken Kingdom) sets you to trekking across landscapes and shooting from the bed of your truck while fleeing zombies, enraged Egyptian pharaohs, and other supernatural forces out to get you. The surprising thing about Gunpie Adventure is that it tries to take itself seriously in offering more depth than just the standard succession of levels that we’re used to in the average freemium games for Android. Here we can pick from several heroes and beat levels set in well-known locations, all through a story that even allows itself the luxury of sweeping cinematic takes here and there. 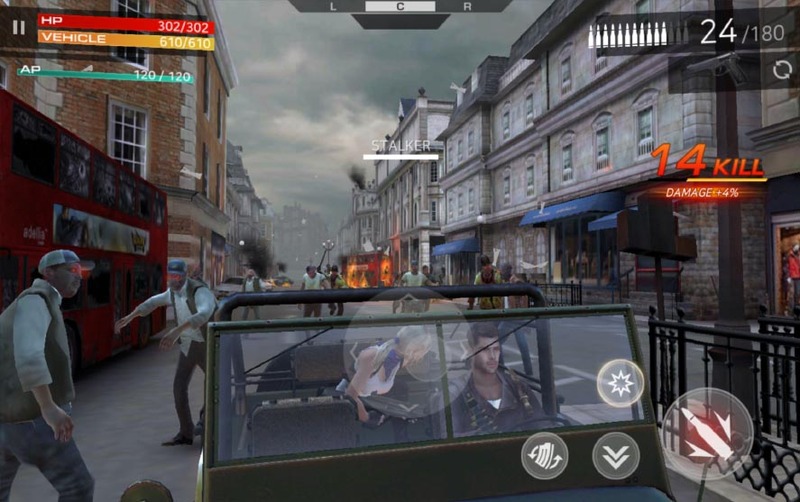 With some more than decent graphics that manage to convincingly orient the game’s old-school aesthetic within the golden age of the genre, Gunpie Adventure has an endearing element of crusty adventure where you’re as likely to be fleeing a horde of bloodthirsty zombies through the flaming streets of London as trying to annihilate the enormous earthly incarnation of the Egyptian god Sobec at the foot of the pyramids of Giza. In terms of the controls, there’s no other option but the touchscreen, with a D-pad to aim and buttons to shoot and block. In certain circumstances you might find yourself limited by the controls, and in fact the feeling is almost better on an Android emulator for PC than on an actual device. What’s clear, though, is that Gunpie Adventure is a proper and fun revival that offers an experience quite removed from the standards of mobile gaming. Definitely a welcome change.